Manchester City manager Pep Guardiola has criticized Benjamin Mendy's social media addiction. The France international defender was sidelined by a long-term injury in his debut season at the Etihad but he has fully recovered and back in the first team squad. He featured in Sunday's 2-0 win over Arsenal at the Emirates and has a good game. 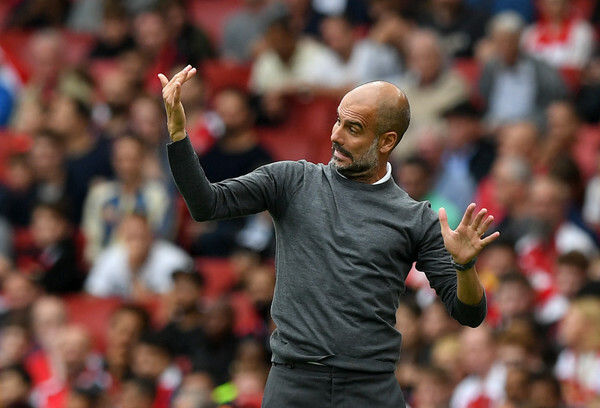 Mendy is known for his social media behavior despite been a top player and Pep Guardiola has addressed it in an interview after the Arsenal game. Guardiola said that the 24-years-old defender has a lot to improve on and needs to reduce his social media addiction. "Mendy is Mendy," Guardiola said. Pep Guardiola continues to praise him: "Sometimes we want to kill him and sometimes you think wow what a player we have. He gives us energy." Then said he needs to improve on some aspect and criticized his social media antics. "Mendy has a lot of things to improve and hopefully we can convince him to forget a little bit the social media and improve a few things". Mendy has responded to Guardiola via his twitter handle promising to do as his boss said. The former Barcelona coach also praised his team for starting their title defense with a win at the Emirates. “I think going away to the Emirates is always so complicated,” he continued. “Especially in the first game when Arsenal have a new manager. “We played a high level considering the lack of physical condition for many of the players who arrived back lack after the World Cup.